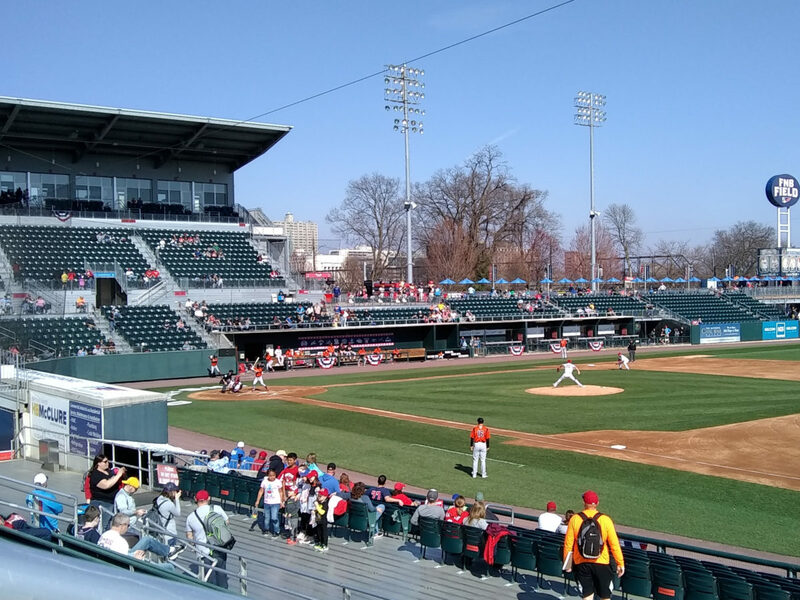 The Harrisburg Senators began their 2019 campaign on Thursday with an 8-4 victory over the Bowie Baysox. Friday night’s game was rained out and rescheduled for Saturday doubleheader. I had a ticket for Saturday’s night, one I bought the day individual tickets went on sale early in March. Now I was getting two games for the price of one. Good fortune, indeed! The Senators’ roster here in the season’s early going has some important storylines for the Nationals: Michael A. Taylor is on a rehab assignment; Erick Fedde and Spencer Kieboom are in Harrisburg, rather than Fresno, for proximity to the parent club should needs arise; and Aaron Barrett is pitching and trying to work his way back to the major leagues following his gruesome elbow injuries. The game was also the Senators’ “Halfway to Halloween” game. Yes, by the calendar, it’s about three weeks early, but the idea was sound. Kids were encouraged to dress up in costumes, Field of Screams was on hand to do zombie make-up on fans, there was a kids parade and trick-or-treating in the ballpark, and the Holiday Inn Harrisburg East sponsored the t-shirt giveaway. 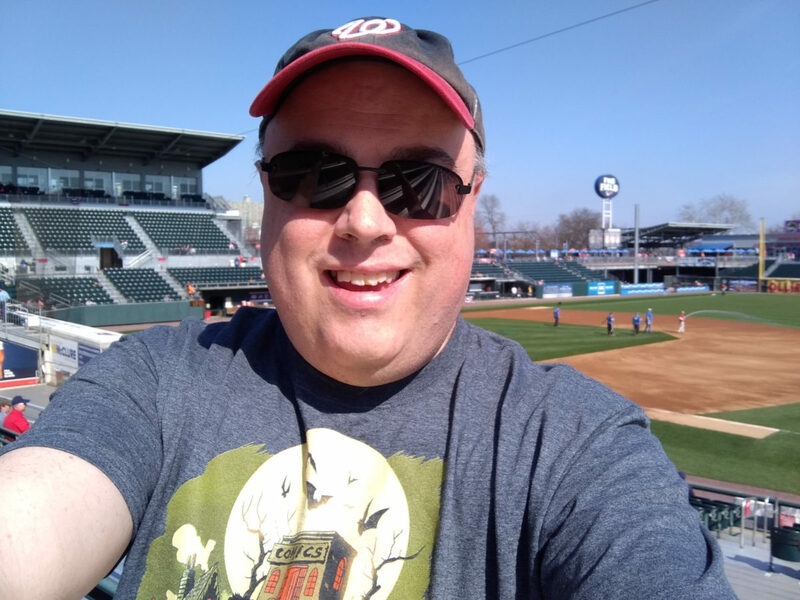 I’m not sure I will ever wear the t-shirt, but as someone who went to the University of Richmond I appreciate that the t-shirt has a spider on it. I got in the “Halfway to Halloween” spirit by wearing a Halloween ComicFest t-shirt with an illustration of Dracula, the Frankenstein Monster, and the Wolfman reading comics by Afterlife with Archie‘s Francesco Francavilla. I did not have Field of Screams paint my face to be all zombie-esque. Zombies aren’t my thing. April 6th is also National Tartan Day, and I might have accessorized the Halloween t-shirt with a kilt if only I owned one. On second thought, maybe not; I wouldn’t have wanted to sit on a metal bleacher (which was still somewhat wet from the previous day’s rain) in a kilt. 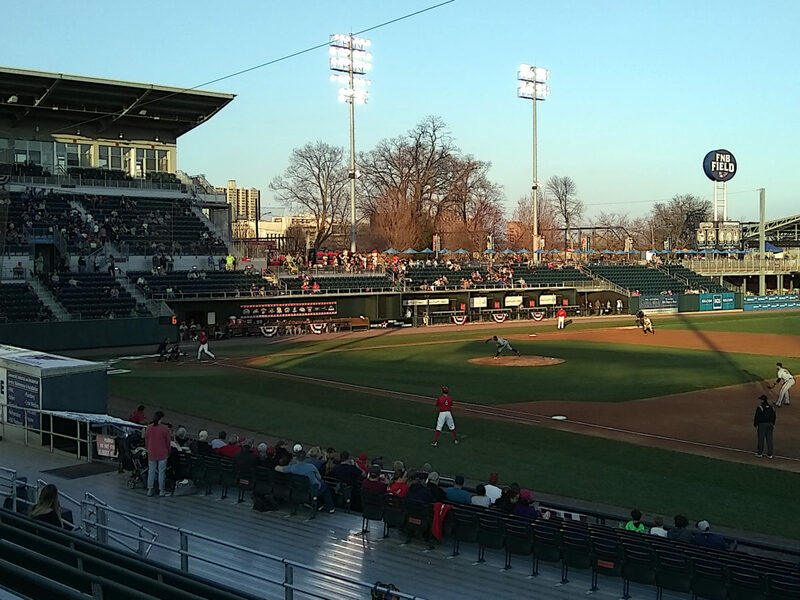 The home of the Harrisburg Senators was much the same as last year. There were a few cosmetic changes one might not notice — the foul poles are no longer decorated with Turkey Hill advertising, for instance. 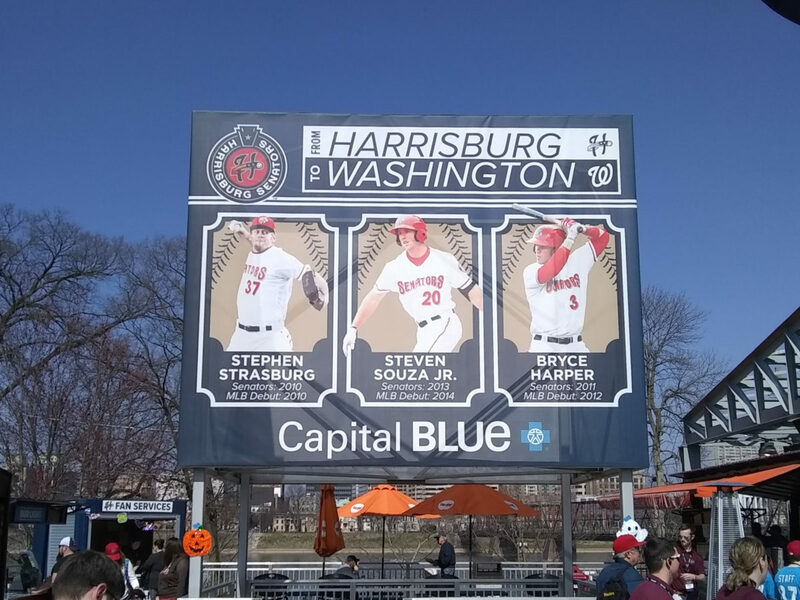 The Stephen Strasburg banner that hung over the left field gate inside the park has been replaced by a banner of multiple Senators who have made the majors, two of whom are no longer with the Nationals, one of whom is out for the season with an injury. The Bobblehead Hall-of-Fame statues on the third base concourse were repainted over the offseason. They had looked weathered and beaten last year, now they’re sprightly and sharp looking. In the first game, the Vladimir Guerrero bobblehead statue took a hit from a foul ball. There are several new between-innings events, like the Anti-Freeze (a race between a fan and a guy in a super-hero costume). The Senators seem to have retired the Racing Monkeys (Bingo, Bongo, and Steve) and replaced them with a Little Presidents Race: four children were dressed in George Washington, Thomas Jefferson, Abraham Lincoln, and Theodore Roosevelt costumes, and they ran from the third base side to the first base side around the edge of the infield dirt. 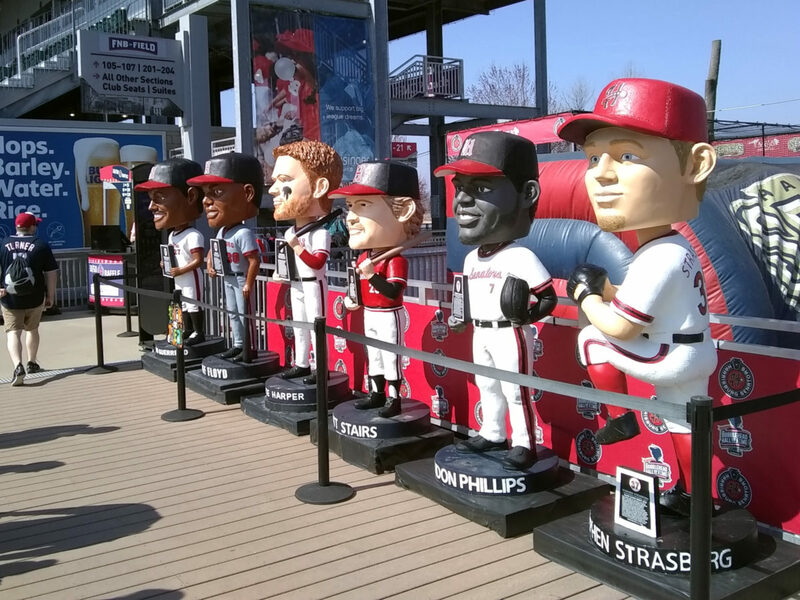 Saturday’s Little Presidents Race was judged a tie between George and Abe. The crowd was sparse. Announced attendence was about 2,300, and it felt less than that. People packed and left after the first game. There might have been fifty people in the bleachers in the first game; in the second, it maxed out around a dozen. If memory servies — I had the game on the radio, and I was talking to my mom on the phone to see how her doctor’s appointment after having a pacemaker installed last month went — in Taylor’s rehab assignment on Thursday he went 0-4 with two strikeouts. Taylor picked up where he left off on Friday night with a strikeout in the first inning, followed by another strikeout in the third. In the bottom of the fifth, Taylor then crushed a home run to left-center that made the score 5-2 Baysox, and in the bottom of the 6th Taylor battled Baysox pitcher Zack Pop (the Orioles’ 29th prospect, according to the program book) in a thirteen pitch at-bat (at one point, fouling off six straight pitches) that ended with a long flyout to the warning track in left-center. Taylor had a number of chances in the outfield as well in the first game. In game two, Taylor was the Senators’ designated hitter. 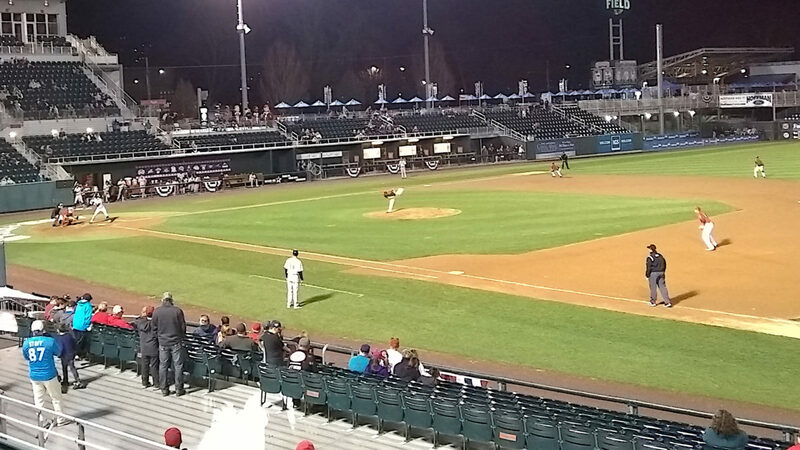 Against the Baysox’s Dillon Tate (Orioles’ #18 prospect) in the first, Taylor struck out on a seven pitch at-bat. He had a hard hit ground ball into center past the pitcher and middle infielders in the third. In the bottom of the fourth Taylor was hit by a pitch, and in the sixth Taylor struck out on a six pitch at-bat. I couldn’t say how close Taylor is to returning to the Nationals. His fielding looked fine, but his bat didn’t. Fedde had a difficult outing against the Baysox. The problem wasn’t that he put the Senators in an early 5-0 hole, one that I thought would be inescapable. The problem was he appeared to have difficulty finding the plate and he had no quick outs, quickly running up a pitch count that I expected would lead to an early exit. In three of Fedde’s five innings of work, he faced the minimum, but in almost every case he went deep into counts. Then there was the second inning. Fedde walked the leadoff battle, Anderson Feliz. He struck out Martin Cervenka for the first out, and Cael Brockmeyer, after a battle, crushed a ball that died on the warning track in left. The third out proved to be a challenge. Fedde ran up a 3-2 count on Preston Palmeiro (the son of Rafael Palmeiro), and then a pitch clock violation was called as a ball and Palmeiro was awarded a base. 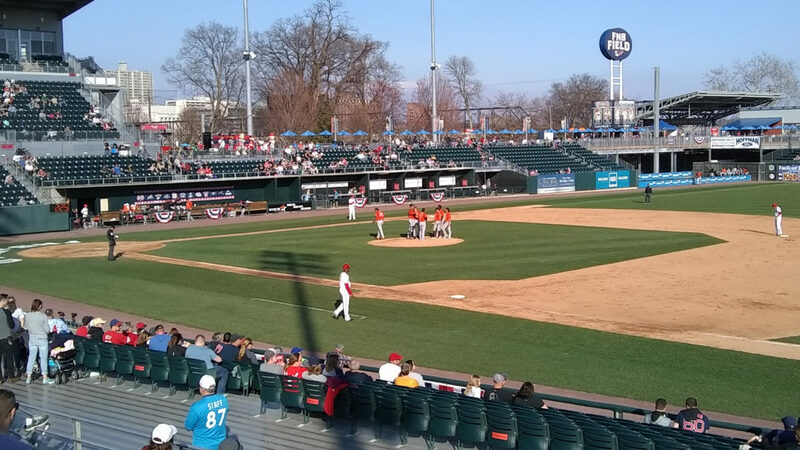 Back-to-back singles into center from Sean Miller and T.J. Nichting scored runs, and then Ryan McKenna (Orioles’ #7 prospect) hit a three-run home run to the right field concourse. A broken bat hit by Dylan Bannon to Senators second baseman Bryan Mejia and a toss over to first ended the inning, but the damage was done — five runs, all with two outs. 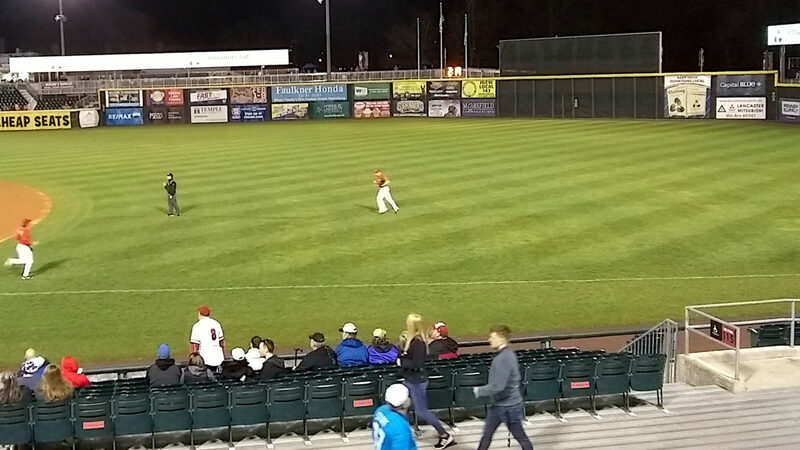 Fedde at least made it through five innings; his Baysox counterpart, Hunter Harvey, did not. Harvey allowed home runs to Taylor and Drew Ward followed by a double to Ian Sagdal (a nice hit down the third base line that died midway between the third baseman and the left fielder), at which point he was pulled and replaced by Pop. An out would get Pop out of the inning with a 5-4 lead, and Spencer Kieboom almost gifted Pop with that out, a hard hit ball to Baysox shortstop Sean Miller, but Miller was unable to field the ball cleanly and his throw to Palmeiro at first was a little wide of the bag. Kieboom was safe and Sagdal came around the score, tying the game at 5. 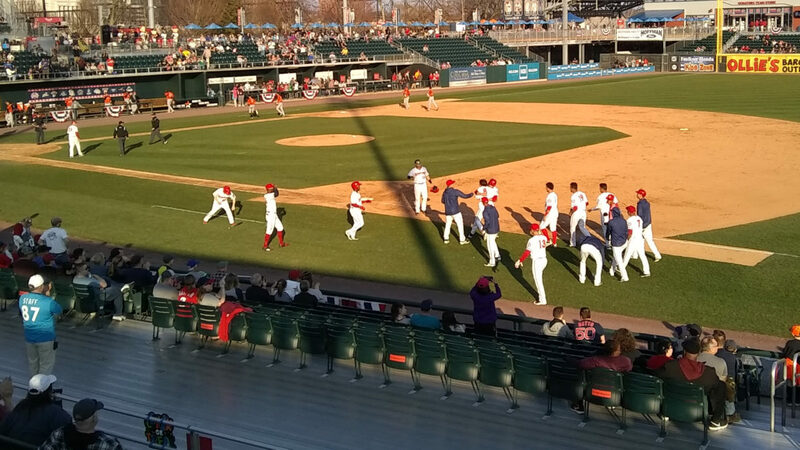 The first game ended with a walk-off win for the Senators. The Baysox brought on Tyler Erwin to pitch. The crowd got excited when the first batter, Austin Davidson, made contact and the ball carried out to right field… and then quieted as the ball fell into the glove of right fielder Yusniel Diax a good thirty feet from the wall. Erwin then gave up a single to Drew Ward, Ian Sagdal walked, and Zach Collier was brought in as a pitch runner for Ward. A slowly hit ball to third by Spencer Kieboom (and a late throw over to first) loaded the bases. Rhett Wiseman then hit a fly ball to right near the line for a sacrifice fly that scored Collier and ended the game. From where I was sitting, based on the ball’s trajectory and where Yusniel Diaz was standing when he caught the ball I suspect that had he let the ball drop it would have gone foul. Barrett’s promising career was derailed a few years ago due to injuries — first, a Tommy John surgerty, then a gruesome injury in which his elbow basically broke apart. But he’s attempting a comeback, and Thursday night he took the mound in the 9th for the Senators, locking down an 8-4 victory. I wasn’t sure if I’d have the chance the see Barrett on Saturday but, with two games, I was hopeful. 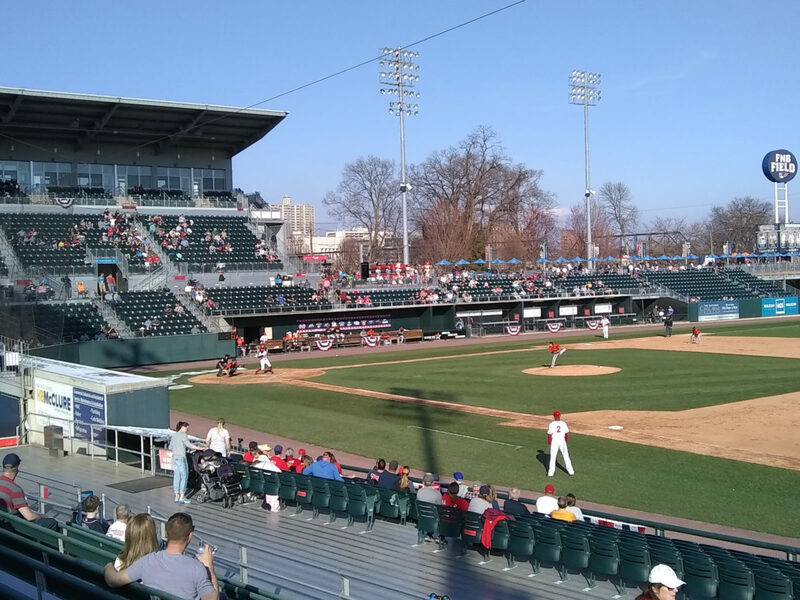 The Baysox took an early lead on Mario Sanchez in the second game; Dylan Bannon hit a home run in the first, and the Baysox manufactured a run in the second on a series of singles. 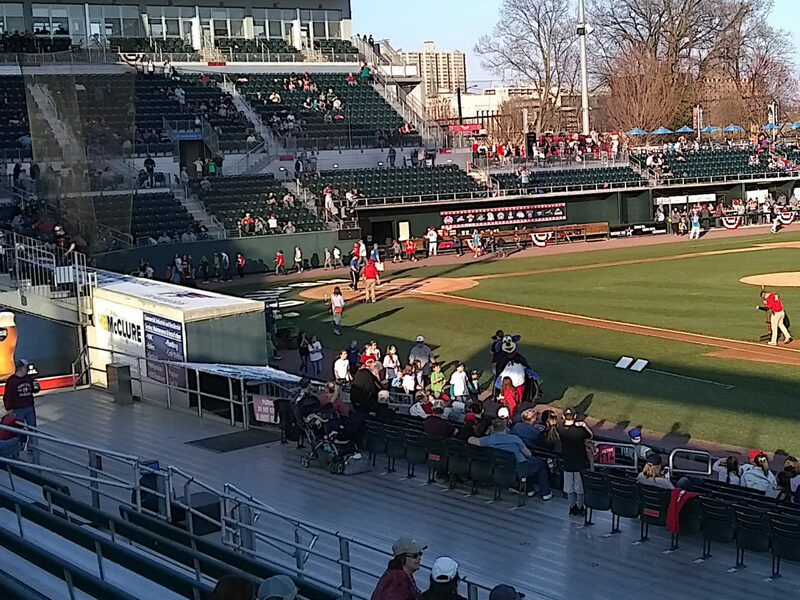 Drew Ward’s three run home run over the ribbon board and into the trees in right center in the third put the Senators up 3-2, and Rhett Wiseman added an insurance run in the bottom of the sixth with a home run over the Senators bullpen in right and into the trees beyond. I was impressed with Barrett from the first time I saw him in Harrisburg in 2013, and it was fantastic to see him on the mound again. I admit, I stood up when he was standing on the mound, throwing his warm-up pitches, and shouting, “It’s the Bear! The Bear is back! 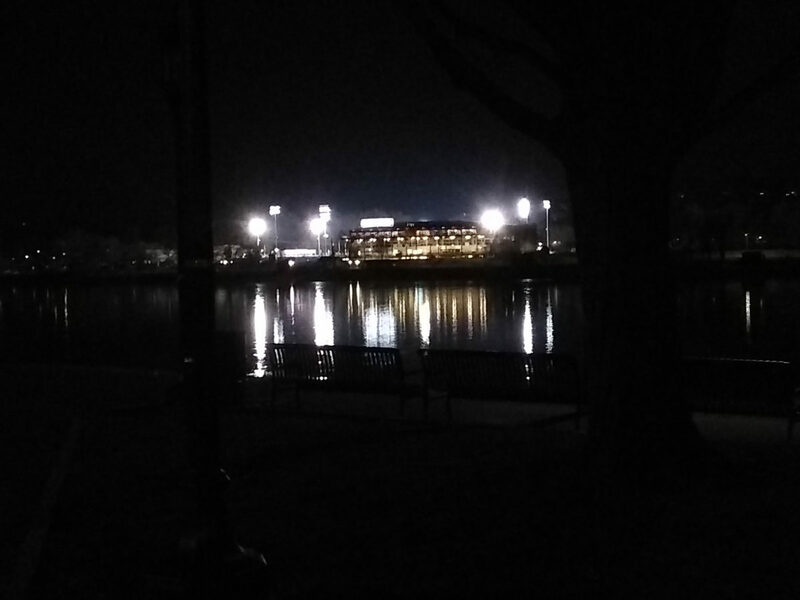 The Bear!” And, as quiet as FNB Field was at that point, I feel like everyone in the stadium heard that. I genuinely felt happy seeing him there. He looked like the Bear of old. 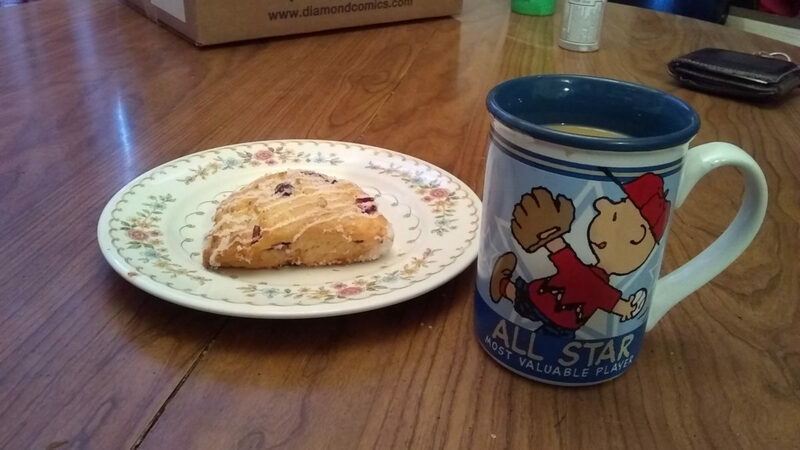 I was so excited to see my first in-person baseball this year that for breakfast I broke out a Charlie Brown baseball coffee mug. That, and an orange-cranberry scone, was the perfect way to get my day started. It came off the bat of the Baysox’s Cael Brockmeyer in the top of the fourth in the second game. 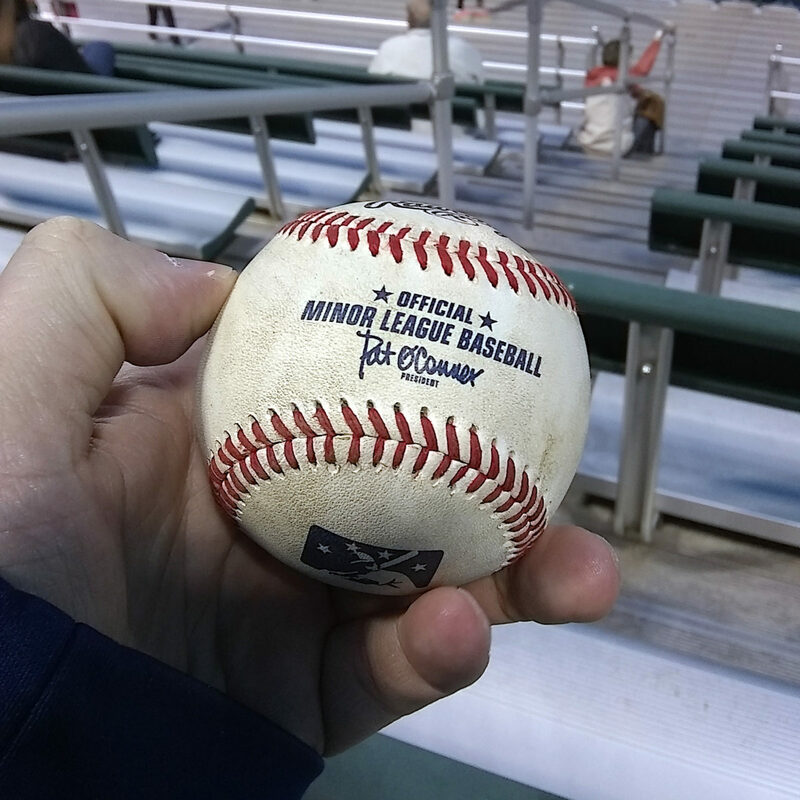 It landed in the bleachers one section over and one row up. It rolled my way, and I picked it up. At this point, there were all of a dozen people in the bleachers, none of them kids. The ballhawk kids who roamed the deck below the bleachers came screaming up the stairs and started looking for it. “It’s in my pocket,” I said. He harrumphed and said to the others, “He has it.” They trudged back down the stairs. There was a kid in the bleachers in the first game. He came and talked to me; he and his sister decided to wander around. It was his birthday, and he said this was his first baseball game. I’d have given him the ball, had his family not left after the first game. But these ballhawk kids, none of whom even sat in the bleachers? No. All in all, it was a good outing. I saw two tightly played baseball games. 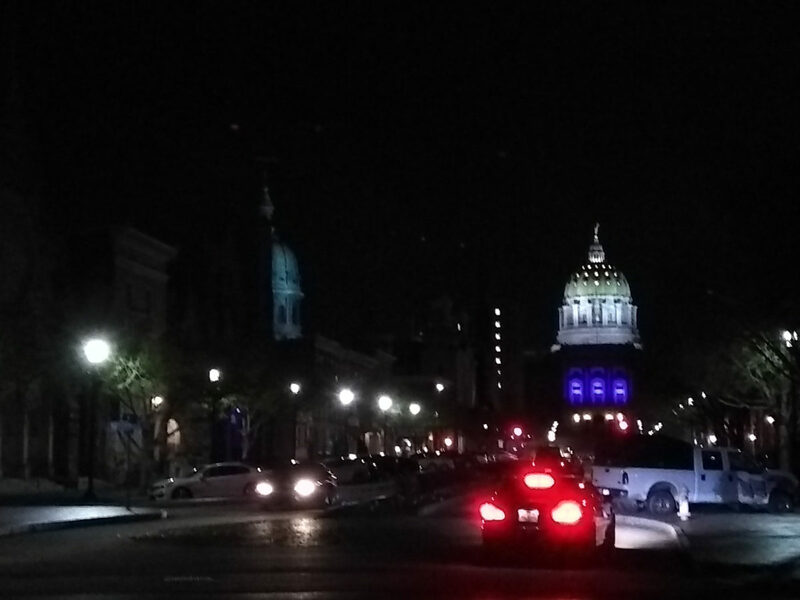 I walked across the Walnut Street bridge as I like to do so I can see the state capitol at night. I came away with an unexpected souvenir. And I saw several players in the Nationals plans do baseball things. The Senators have opened their season 3-0. Today, they’re going for a sweep against the Baysox. I’m back on City Island in two weeks for a Saturday afternoon game against the Reading Fightin’ Phils.